Runbow has been around for a while. First debuting on the Wii U back in 2015, it was a great party game that up to 8 people compete with a relatively simple always-running mechanic. Cut to 2018 on new hardware, and — surprise! — it’s still great. Now on the Switch, Runbow delivers the same fast-paced and easy to understand gameplay that made its initial debut so charming. We just run. Sometimes we jump, sometimes we punch, but we’re always running in one direction or another, and always together. Or rather, we *should* be if we want to finish. A secondary, and perhaps much more unique, mechanism revolves around shifting background colors that make obstacles and platforms appear or disappear in front of (or underneath) us. So, if we’re on a red platform when the blue wave comes in, we’re fine. But once the red wave is about to hit, we’d better be ready to jump. It’s simple pattern repetition, but can lead to tricky and challenging platforming that often leads to failure. The game revels in either winning or losing. There’s no second place, no brownie points for trying. Players have to reach a goal, whether it’s in single or multiplayer modes. The game doesn’t punish us for it, because once we’ve figured out the color pattern we realize that it’s more of a rhythm game than it actually is a side-scrolling action one. The single player experience is fine, requiring us to make our way through several challenge levels until we complete the main “plot.” Laid out as a sort of giant chess board, we can clear all of the panels, or just take a direct route to the end. Did I say it’s fine? It’s fine. But it can also get pretty hectic and demanding, depending on the type of challenge within. We can zip through it all to unlock more characters and features, but there’s plenty of replay value, as the levels themselves have sub challengers to acquire certain numbers of stars. But the real meat is the multiplayer. It’s designed as a party experience, with plenty of people yelling at each other and cheering or jeering. And that will most certainly happen as soon as the first event starts. Whether it’s a race to a goal, or an all-out brawl, the chaotic aspect of the action is by design. Matches can be configured as we please, with or without effect changing items, requiring a set number of wins, or just an open experience. This version of the game is missing the Color Master mode from the Wii U version, which let one player control the effect and color experience for others via the touch screen. 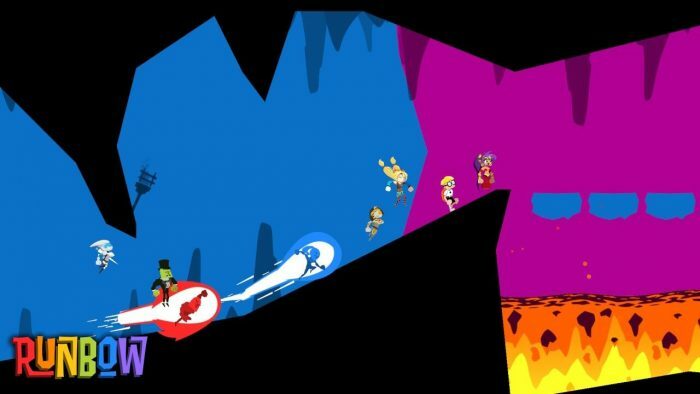 Runbow hasn’t lost a visual step over the last few years, either. Its clean visual art direction is bright and colorful, and holds up on monitors of any size. We’ve been playing it a lot on in tabletop mode, as we can separate the Joy-Cons and have an instant party session anywhere we go. In fact, because it’s so bright and colorful, it seems to fit this mode better than most other games do on the console, and doesn’t strain our eyes in the process. There still aren’t many games like Runbow out there, even on the party game rich Switch. What it lacks in gameplay depth it more than makes up for in replay value and sheer amount of modes and things to do. It fits right alongside college gaming favorites like Mario Kart & Cards Against Humanity, and with a few friends can lead to some obnoxiously loud nights. This review is based on an eShop code for the Switch provided to SideQuesting by the publisher.